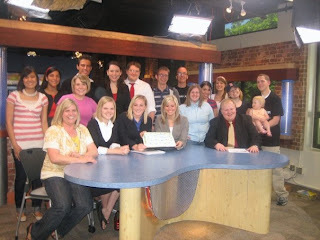 The crew at BYU Daily News, Spring 2008. Can you see me? 1) At KPHO, it always smells like coffee. Having lived in Utah for the past three years, I forgot what coffee smelled like. 2) At KPHO, people swear. A lot. At the DN, you hear "crap", "heck" and "shoot". Or the occasional swear word in a different language, which doesn't really count. I don't think I'd heard the F-word in years until last week. What can I say? The newsroom is stressful. 3) At KPHO, it's not uncommon to see some skin. Forearms and shins are about as as you'll see at the DN. 4) At KPHO, everyone is thrilled at the sight of a baby in the newsroom. At the DN, babies are an everyday occurance (see far right of above picture for proof). That's my list for now. I'm sure it will continue to grow as time goes on. It's interesting to be part of the "real world". Now I fully understand why Provo is so affectionately called "The Bubble." Yesterday was nice. I got to leave early because I'll be going in tonight to help with the CyberBowl. It's a web-interactive newscast about the Super Bowl. Viewers can send text messages to Cardinals players, chat online, etc. Should be fun. All you Arizonans can check it out on Channel 5 at 7:30 pm tonight (unless you're watching Idol)! I do see you! Hey, Hey! Being a little daring and showing your shins huh? Anyway, that stinks that you constantly have to hear swear words. If I'm tired, depressed, anxious, etc. and I hear a swear word, it always makes me a little more mad but when I say some random thing, it always puts me in a better mood.